Most infectious upper respiratory diseases of cats are due to two highly contagious viruses: feline herpesvirus (also known as feline viral rhinotracheitis - FVR) and feline calicivirus (FCV). Both viruses cause similar clinical symptoms in cats, thus they are grouped together as one disease group, the feline respiratory viruses. A third organism also causes upper respiratory infections and is called feline Chlamydia. All three germs cause various symptoms associated with upper respiratory problems. The symptoms include sneezing, runny nose, coughing and conjunctivitis. Often, several of these germs are found in a cat or kitten suffering from an upper respiratory infection. Kittens, unvaccinated cats, and cats in multicat households are at greatest risk. Cats and kittens are infected by contaminated material as well as from other cats. The disease is occasionally fatal for kittens, however most cats recover. The respiratory disease organisms are extremely contagious, and cats that recover from the disease are often the principal carriers. 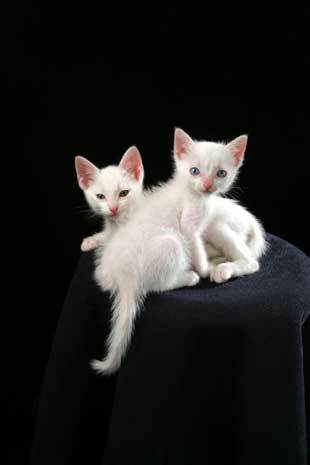 Without showing any clinical symptoms, these cats can remain carriers for months and even years. Some cats never fully recover from the disease and show symptoms throughout the rest of their lives. Once several cats becomes infected, the disease is almost impossible to eliminate from multicat households. -FVR - sneezing, nasal discharge, coughing, salivation, and corneal ulcers. -FCV - oral ulcers, sneezing, conjunctivitis. -Chlamydiosis - predominately conjunctivitis and eye problems, mild sneezing, nasal discharge. Vaccination against respiratory viruses is strongly recommended. Usually the respiratory vaccine and Feline Distemper vaccine are administered at the same time. A series of two or three vaccinations are administered to a young kitten. These vaccinations are given at 2-3 week intervals beginning when the kitten is 6-9 weeks old. Regular booster vaccinations are recommended. The Feline Respiratory Viruses are extremely contagious and special considerations must be taken into account. Close contact between cats is not essential for spreading the disease. Food bowls, water bowls, bedding, and play toys are possible sources of infection. If a cat infected with the respiratory disease organisms is picked up and held, the germs can easily be transmitted to another cat via the person's clothing. It is strongly advisable to wash hands thoroughly (with a good disinfectant soap) after touching a cat that may be a carrier of this disease. When introducing a new cat into a multicat household, special precautions must be taken. 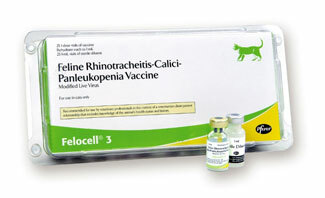 Resident cats should be up-to-date with their vaccines. The incoming cat should receive a vaccine and be quarantined for 3 weeks. The effect of the vaccine and quarantine is twofold: (1) Protect the incoming cat from viruses in the multicat household, and (2) Protect the resident cats from the new cat that may be infected or in the state of disease incubation.